I seriously think that Grant Morrison is trying to rewrite our OS the same way that Apple or Microsoft upgrade their operating systems every couple of years. In his DC Comics, it books like The Invisibles or even Multiversity which try to upgrade our perceptions of reality, colored by the action/adventure adrenaline of those heroes. His X-Men stuff was all about rewiring how any why the X-Men worked as a mirror of the real world even if Marvel was quick to backtrack on it once he left. His Annihilator with Frazer Irving (published concurrently with Nameless) was a fantasy horror book that tried to upgrade us on multiple reality levels. His most recent attempt at introducing a new operating system to mankind happened in Nameless, a book which one of the characters in it describes the plot as “The Exorcist meets Apollo 13. Nameless complements the work done in Annihilator as both books give Morrison a far darker and sinister level to work on but in the end offers are a far more complete reboot of our systems of perception than Annihilator did. In tech terms, think of Annihilator as a final beta of this system while Nameless is the full, ready-for-prime-time release. (You could even make an argument that Multiversity is an add-on for this os but that’s a piece for another time.) But what’s odd about this golden release is that it’s a virus. Nameless isn’t something that you download and wait to see what kind of groovy new features will be included in this release. It’s a worm that sneaks into your system through the trojan horse of this comic. Chris Burnham and Nathan Fairbairn are equal partners in this latest virus/update of Morrison’s operating system. Together, this trio creates a haunted house story that stretches back to before the dawn of mankind and into a recognizable future of rich, industrial men really running the world through their technological breakthroughs. Their story tries to disguise itself as one thing at first, a haunted house in space story, before revealing a second possible aspect. 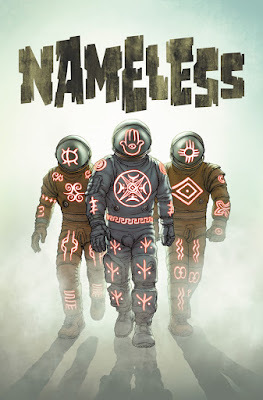 About midway through the book, you’re faced with the possibility that the first half of Nameless is really just the main character’s way of processing a far more horrible reality and fate than what we’ve been shown up to this point. As a horror story, Nameless plays with our perceptions of reality, dangling possible ones in front of us without ever completely revealing a truth to us. The main character, known as “Nameless” because he won’t give that power of his name to anyone, may either be the hero of the villain of this comic. Morrison and Burnham show him trying to rescue our world from an impending collision with a chunk of a long-lost planet while for all we know his greatest sins were committed years ago and all this story is really trying to do is just make sense of the world he now lives in. A lot of Morrison’s comics ultimately fall short because the artists aren’t able to keep up with him. It feels like no matter how clear he tries to make his scripts, the artists sometimes aren’t able to make heads or tails of it and that ultimately impacts the reader’s experience with the story. I’m thinking parts of his Batman run and even his Action Comics where there were often unintentional disconnects between what was happening narratively and what was happening visually. In Nameless, those disconnects show up but it’s far from unintentional here. 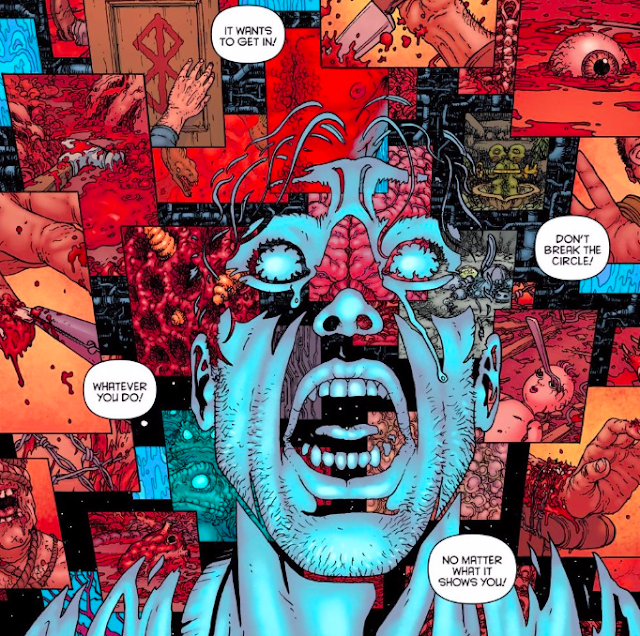 Burnham’s artwork doesn’t obscure the story as it reveals the complexity of the existence that Morrison is trying to encode into us. Even as Burnham artwork hints at the things that go bump in the night in this haunted house of existence, Nathan Fairbairn’s colors provide an almost candy-colored light to these horrors. As Morrison and Burnham bounce back and forth between the possibly true elements of this story, Fairbairn makes it impossible to look away from what’s happening. His vivid and solid colors help create these images that burn into your brain as you’re reading them. The colors are just another part of this system rewrite that these creators are trying to accomplish in our brains. Nameless and Annihilator both deal with invasions of higher realities into our own. As multiversally primal creatures, maybe even gods, try to inject themselves into our level of being, the disruption is cataclysmic. Nameless is basically about the prisoners of war of an ancient war between angels once again being introduced back into our space. It’s this collision of reality and myth that begins the task of rewriting us to believe in the power of these ancient legends. Morrison refuses to let us accept reality on its surface level. The magic he wants us to experience exists as the basis of reality and it’s pissed that we ever lost sight of it in the first place. This book produces a visual translation of this system upgrade (another more Morrisonian term for it may be magic spell) that functions as our installation manual. But it’s not some easy step-by-step manual that you would get to put together an Ikea FJÄLLBO entertainment unit. Morrison and Burnham's operating system instruction manual is more like an arcane religious text that references gods and monsters that mankind forgot about millennia ago. If this upgrade works, it accomplishes its goal on some subconscious level that you possibly don’t even acknowledge when you’re done with the book. Nameless deals with ancient threats recontextualized for our times. The true horror of this book may just be how small and insignificant mankind is compared to the true forces that Morrison, Burnham, and Fairbairn speculate may be out there. 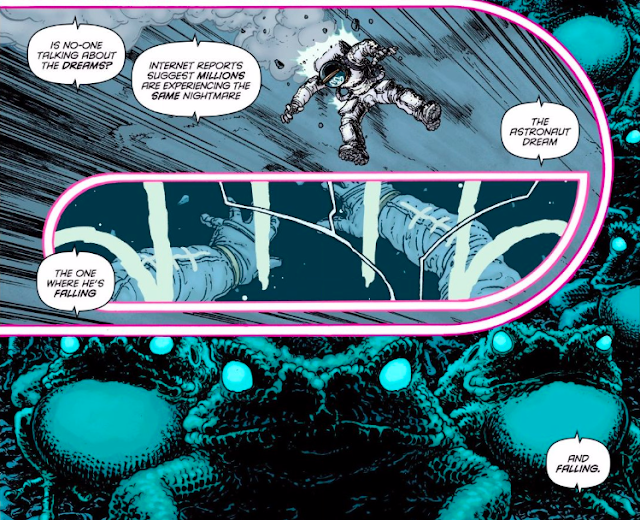 At some point during Grant Morrison and Chris Burnham’s Nameless, you have to wonder what is real in this comic. It’s a bit in that classic Morrison way where his stuff is just so outrageous that you question the reality of what he’s actually writing. Is this a story about a man trying to stop an Armageddon-like haunted asteroid hurtling towards the earth or is it the story of a man who lost his mind during an alien invasion in a spooky haunted house? Probably the correct answer is probably “both” with a side of “it doesn’t really matter” thrown in.